The fundamental objective of the Summer Institute this year is to provide ASEAN Secretariat officials, relevant ASEAN bodies (ASEAN Intergovernmental Commission on Human Rights (AICHR), ACWC, ACMW, relevant ASEAN sectoral bodies), and experts from the academia and civil society with a platform to discuss the AEC and its interconnection with other ASEAN Community pillars and principles, including those enshrined in the ASEAN Human Rights Declaration, in order to ensure a harmonized, coordinated regional approach to the prevention of and response to increased human rights risks. 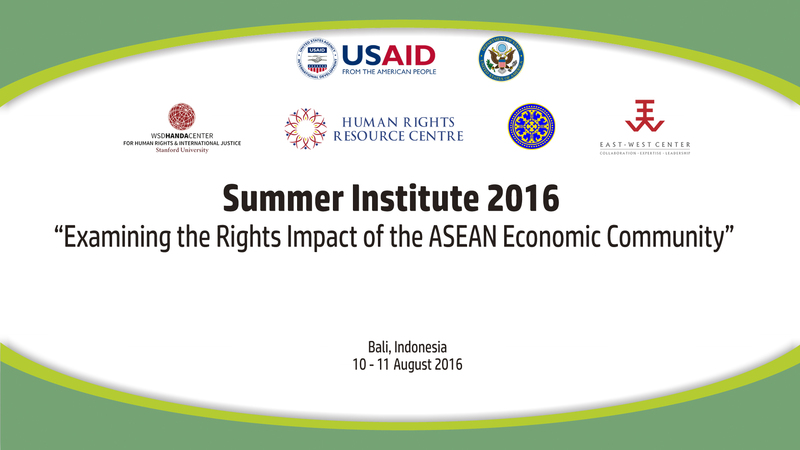 The Summer Institute is organised by the Human Rights Resource Centre, WSD HANDA Center for Human Rights and International Justice at Stanford University, Udayana University and East West Center. The event is supported by the United States Agency for International Development and the Ministry of Foreign Affairs of Singapore. ASEAN, Events, Indonesia, Vulnerable Groups. permalink. Human Rights Resource Centre | All rights reserved.